Oh, the joys of summer in Virginia. The forecast this past week was a high in the upper nineties every day, with 1000% humidity and a chance of thundershowers. Also every day. Makes you want to go to the pool, doesn’t it? Or at the very least, sit in a very air conditioned room with a tall glass of water/ice tea/white wine/refreshing beverage of choice. It’s a good season for salads. I was pleasantly surprised when a perusal of my kitchen revealed *almost* all of the ingredients for a cobb salad. 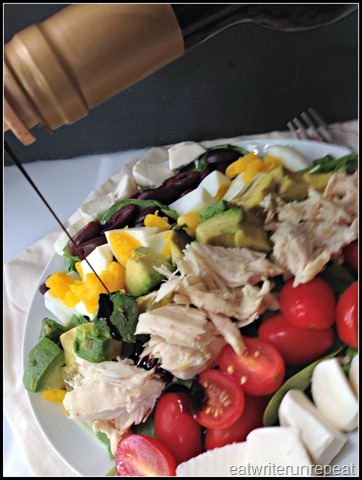 I didn’t have any bacon, so I subbed kalamata olives to get an equally salty flavor, and instead of blue cheese I chose fresh baby mozzarella – but the main points of this salad are classic Cobb: mixed greens, cherry tomatoes, avocado chunks, hard boiled eggs, and roasted chicken. Not only is it pretty, but this salad is incredibly filling – this is a salad that definitely passes for an entree! I can only eat a salad as a meal if it has enough protein to keep me full until the next meal (usually dinner, as I’ll eat a salad with some protein for lunch at work). 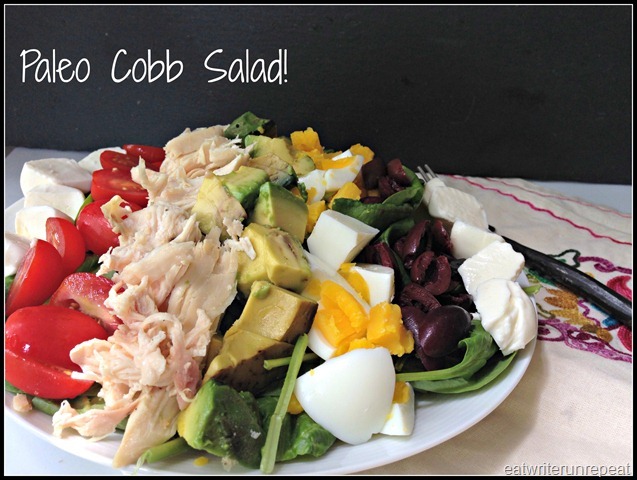 With the double protein hit of the chicken AND the hard boiled egg, this salad is a winner. 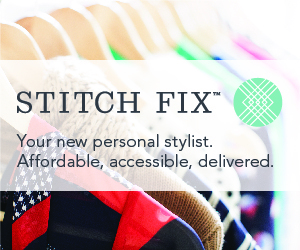 Plus…have I mentioned it’s pretty? I feel like I’m totally cheating, posting a “recipe” for a salad, but I’ll do it for posterity sake. Enjoy! Lay your mixed greens on a plate. Top with stripes of each ingredient. Drizzle with your favorite dressing. Eat! 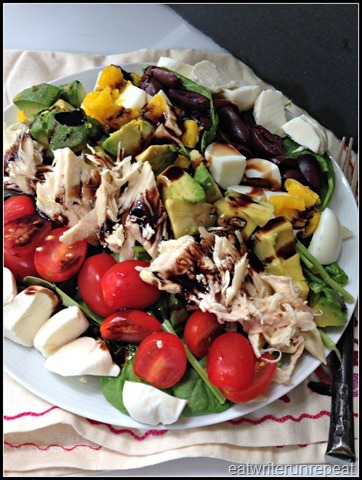 Posted on 28 June 2014 25 June 2014 by BeePosted in Lunch, Paleo, Salads, SummerTagged Chicken, cobb salad, paleo, Salad, summer recipes.